Evam is a talented young theatre group from Chennai, and “The Importance of Being Earnest” was their first home production. They staged two shows at Chowdiah Memorial Hall on Christmas Day. As usual, the cast of the play got their comic timing right, and the audience thoroughly enjoyed themselves, laughing at well-quoted Wilde lines such as “It’s a great thing to the 35, I’ve been 35 for years!”, and sometimes laughing at the well-rehearsed comic interaction between the cast members in their various roles. The sets were designed to provide exits and entry points, and there were a couple of displays of ballroom dancing that had the audience clapping. However, the sets did take a little time to set up between scenes and acts, and that did break up the narrative a bit, but luckily the plot was not too intricate to follow. The stage properties were fairly simple, and the costumes of the Victorian period done fairly adequately..
Evam also made innovative use of the ticket paper when they used a portion of it to ask for the viewers’ contact details. 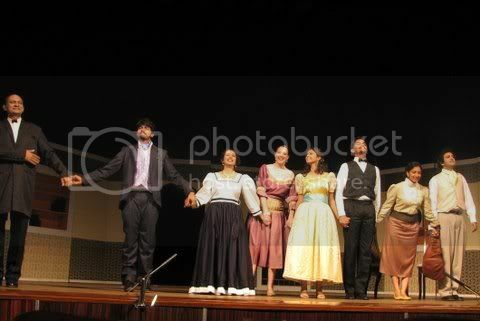 Sunil made the announcement when, at the end of the play, the cast and crew make t take their bows. However (at least not in the 3.30 show which I attended) the cast was not intriduced to the audiences, and we got none of the names of the crew backstage, either. This, I think, is something that Evam needs to rectify. Also, at the beginning of the play, Karthik and a few other members of the cast did fluff their dialogue in a noticeable way; so perhaps they are not as word-perfect with the dialogue as they wish to be. The sets were innovatively designed, but they took time to set up, and it was a good-willed audience which applauded them while waiting in between seats and darkness! Given the popularity of the play and of Evam’s productions up to now, Evam will probably be a smash sellout whenever they visit this city. But I would still ask Evam if they could do a slightly more serious play, and also contact information. I gotta tell you – I did not enjoy the show at all. The actors were visibly uncomfortable with the language. They were fortunate that the script by itself was funny, otherwise this evening would have been hurtful. The time taken for the set change was unbelievable. It was shabbily managed. I paid 300 bucks for this show and I got zero back – left with just one thought – Evam is starting to take its audience for granted. I first watched Evam in the Odd couple, where they were really good. The only other play i liked after that was ART. Its their style. They should stick to that. I think they went horribly wrong with this play. I wish them luck with their future endeavours and the MTV youth icon thing, but as far as i am concerned I am going to think twice before buying another ticket for an Evam show. I appreciate your feedback because it shows that you have a keen interest in theatre. I am, however sorry that you felt we as a cast were uncomfortable with Wilde’s incredibly witty language. As I wrote my undergrad thesis on Wilde, I assure you, we appreciate Oscar for his remarkable sense of humour. I cannot speak for the rest of the cast, but I certainly do not take any audience for granted. Without you, there would be no play, no laughter, and certainly, no joy for us on stage. Perhaps you would come as my guest to our next performance in Bangalore January 9, 10, 11. I would gladly meet with you after the performance and discuss. Thank you for the invite. I wrote a review on the play on my blog. I remember having mentioned there that you and the other girl with curls (sorry i don’t recollect her name) were the only ones who seemed comfortable with the language. I don’t know if you’ve heard this critique earlier but yeah the show didn’t go down well with most of us. Let me highlight the things that I think went wrong so that you could work on them in the next shows. Of course, its at your discretion to use or dismiss these comments. 1. Karthik Srinivasan struggled with the language. He seemed to be racing through his dialogues. I hope he can work on that. he has great comic timing otherwise. 2. Please get someone to speed up the set changes.Those guys looked lost. 3. The dance sequence involving karthik kumar and the girl who played Cecily was un-engaging.The girl had no energy. 4. The same girl (Cecily) maintained her poor energy levels through out the play. One had to strain one’s ears to really listen to her. She seemed too nervous overall. But I guess it was her first play, so hopefully she will get better with more performances. 5. The person playing the doctor seemed to be shuffling a little bit. Seemed a tad amateurish to me. He did not seem comfortable in his movement. I mean these comments in good spirit and hope you will receive them that way.I hope Evam do more shows of the play. Best of luck ! I certainly do appreciate your feedback and take it in the spirit in which it is given. Please do not ever think that we take our audiences for granted, though. We really do need you and hope that we are able to give you a memorable experience. I hope we have the chance to meet in person over a cup of coffee and have a long talk about theatre! I am gonna have to agree with most of what anshubora275 has said. It was evident from the very first frame of the play that Evam was taken out of its comfort zone. The famous ‘tongue in cheek’ humour, characteristic of any British comedy, requires the panache that most of the actors could not measure up to. With the exception of the actors who played Lady Bracknell and Miss. Fairfax, the rest of the cast failed to provide the right character to the play. On the technical/production front, I felt the sets were great, but the set changes painfully slow. One does not expect this from a hugely popular, professional theater company. I have been a huge fan of Evam for the longest time. I was entertained to the T by their earlier productions – Art, The Odd Couple, Hysteria, etc. But honestly, this one let me down. I wouldn’t go as far as to say that Evam has started taking its audience for granted but, ‘The Importance….’ would feature way down on my list of favourite plays. One could overlook some of the flaws of the play on the grounds that it was the first time it was performed (if I am not mistaken). I do hope however that Evam rectifies some of the loopholes of this production and leaves no room for criticism in their forthcoming productions. Here’s wishing them all the very best!